SAN DIEGO, CA (April 12, 2015) – For complete coverage please visit www.topdrawersoccer.com. The fourth National Event of the 2014-15 ECNL season wrapped up on Sunday from the Polo Fields in San Diego. The three-day event showed off some of the best teams in the elite girls club soccer league. On Sunday, the fatigued legs and tired minds won out in some of the games as the pace slowed down at the end of a long weekend. However, there were still some games that continued to be played at a very high level including one marquee matchup in the U15 age group. Sunday’s highlighted fixture was a battle between the first and second place teams in the U15 Champions League standings. Both were undefeated heading into the game, and neither had conceded in San Diego prior to Sunday. Both were shorthanded as well. Blues was missing defender Kennedy Wesley and Crossfire was without the services of forward Sophie Hirst. 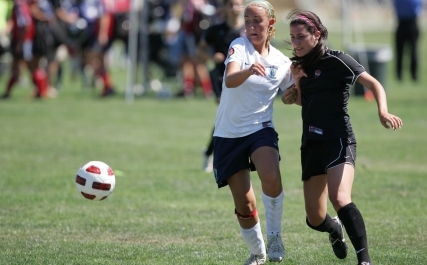 Both were at the U.S. U16 Girls National Team camp in Chula Vista. Their absences were meaningful, but it hardly took away from the quality of the game. So Cal Blues came out on top thanks to two late goals, which kept them in the top spot in the standings. Forward Sydney Duarte had a pair of assists on goals from Skylar Smith and Isabella D’Aquila to help spur the California team to the win. The two teams battled in the first half to a scoreless result at the break. Both sides had chances going forward, but there wasn’t much that troubled either keeper. Blues kept more of the ball thanks to the trio of center midfielders that buzzed around the field. Crossfire tried to use target forward Venicia Juarez as the focal point and worked off her. It had limited success against a determined Blues defense. The second half opened with a bang when Blues center back Chloe Boice hit the kickoff directly at goal and only missed the crossbar by inches. It was an ambitious strike from the defender, who hit it cleanly. The fixture looked like it was heading for a scoreless draw until 10 minutes left an inauspicious movement from Blues resulted in the opener. Blues played the ball down the right side before being turned back toward the center by the Crossfire defense. Duarte squared it to Smith who hit a bending shot that eluded goalkeeper Nerea Arrazola and snuck into the corner of the net. Six minutes later, Blues put the game away. Duarte chased down a bouncing ball forward and squeezed between two defenders before putting her toe on the ball to touch it around Arrazola. D’Aquila beat her defender to the ball and punched it into the open net. For Blues, the win kept the unbeaten season alive with nine games left on the schedule. However, the shutout had extra significance to the squad. Blues have gone 18 games without conceding, which is a new club record. That’s 1,440 minutes of scoreless soccer from the Blues. It’s not hard to see why Blues have been so successful defensively. Goalkeeper Lauren Brzykcy, a UCLAcommit, and the back four of Ashley Soto, Madelyn Desiano, Mahea Heimuli, and Boice offer a formidable test for any opposition. They are sound in their approach and committed as a unit to keeping the goal scoring opportunities to a minimum. If someone does get off a shot, Brzykcy is on the short list for best keepers in this age group. Blues will be a tough team for anyone to face off against in the playoffs. FC Portland finished the ECNL Event in San Diego with an undefeated record after a scoreless draw against Internationals SC on Sunday. It was at times a frustrating game for both sides with chances in front of the game going missing in spots that would normally result in finishes. Portland’s attack was highlighted by the energetic play of forward Kaillen Fried, who seemed to be everywhere at once during moments in the first half. Fried was the most active player in the attack and tried to provide the linking play to spring FC Portland past Internationals. Fried’s work allowed Portland a few moments of sublime ball movement, but the penetrating passing just was not there on the day. U.S. U17 Women’s National Team forward Taryn Ries came off the bench midway through the first half and had a couple of looks on goal, but she could not put anything into the net on the day. Eclipse Select finished the trip to San Diego with a 2-1 record after nabbing wins in the final two games at the event. On Sunday, the Illinois side held a 3-0 lead until there were 11 minutes left in the game. Kaitlyn Kowalchuk scored for Heat off a corner kick from Makenna Curcuru. Kowalchuk tapped home the goal after the Eclipse goalkeeper did not connect on her attempt to punch the cross away. Eclipse answered back with only seconds left when forward Kalyssa Van Zanten had one of the best moments of individual brilliance on the day. Van Zanten beat three players on the dribble before slotting her shot past the goalkeeper. It was a sterling display of dribbling at pace and maintaining composure.